this is a cool idea mimo i always use this tracker and i have found him 3 times! How do i be a cpg mod ive wanted to become one for years!i really want to know! I saw him yesterday on Ascent. im on the server cozy and rockhopper just came whilst i was at the docks then went to forest and into the puffle circus thing for members unfortuntely im not member so couldnt continue following him. mimo this is weird the servers with one green bar say they're full if you click them and full green bars say that you can go in!!! MIMO! I have found a cool glitch. if u go to the iceberg and stand on one side of the iceberg and click the other side, quickly go into your newspaper. When its loaded click out of it and your penguin will be sliding to the other side of the iceberg. You can use this glitch anywhere but its cooler on the iceberg because of the slide!Cool huh? What's a CPG please dont laugh anyway you can't get him he will pass away. Well, you have to answer people's questions (correctly), then put (CPG Mod) after youe name. You can improve your rank by congradulating the weiners of contests. 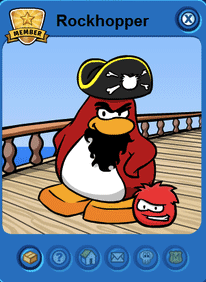 I have never seen Rockhopper and I've played CP 1689 days! frostbite in snow forts im there now. lol funny glitch that you found mickman5! i just tried it out. oh and i asked somebody if they saw that and they said what. CPG means club penguin gang! The club penguin gang is a big group full of users from club penguin who are part of mimo's family and sorry but you cannot join and so far I doubt it that you will ever be able to. he never stays still does he? He never stands still, does he? OMG! Rockhopper is on right now on BLIZZARD which is weird cause some people say they found him there already but he is at the iceberg! - Not trying to find him - I saw him twice this party. Actually you can become a CPG Moderator, but that takes a lot of time and patience. hay mimo do u wanna meet on alska. He just left Big Foot! i can never find him ahh!!! i SAW HIM ON BLIZZARD, AND I NEED HELP FINDING SOMEBODY NAMED PUTTOGETHER. heeey can someone comment on where he is i can never seem to find him!!! !